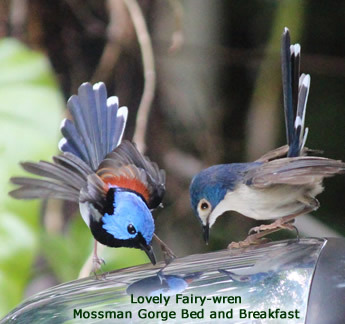 For 20 years - this the most popular tour from tropical lowland areas then beyond the Great Dividing Range to the edge of the outback, this tour is designed for dedicated and amateur ornithologists alike. Those who have restricted time, but wish to observe a wide range of avian fauna. Regular sightings include Black Necked Stork, Kori Bustard, Galah, Pale Headed Rosella, Osprey, Blue Winged Kookaburra, Fig Parrot, Red Backed Fairy Wren, Tawny Frogmouth, Great Bower Bird, Squatter Pigeon, Scarlet Honeyeater, and Victoria’s Rifle Bird, as well as butterflies and occasional marsupials.